Behind every successful woman, there is a tribe of other successful women who have her back, the quote says. The #SheDrivesData series of conversations features such successful women who are thought leaders, influencers and changemakers to inspire, advice and elevate other aspiring women. Today we are talking to a bonafide female force, a leader and a change maker in the data industry - Ulrika Jägare. Ulrika is the Director of Technology and Architecture with a focus on Data and AI at Ericsson. She has authored the book ‘Unified Analytics for Dummies’ and is currently working on her new book for Wiley, ‘Data Science Strategy for Dummies’. It will be published in May this year. In that book, Ulrika has consolidated her experiences on what to avoid in your data investment, how to invest in data as a business and many other topics. 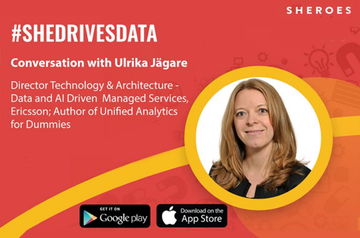 In the following conversation, Ulrika has talked about her amazing journey in data science, her incredible work at Ericsson, advice for data enthusiasts who aspire to become leaders one day and much more - so do read on to get inspired by her energy. Namita: You are passionate about driving digital transformation through a strategic approach to data science, ML and AI. Can you tell us how you first got interested in this field and your journey so far? Ulrika: I was first introduced to Statistics at University as part of my Master in Political Science and worked a couple of years in the field before joining Ericsson (Global Telecommunications vendor) in the year 2000. But it was not until 2010 that I really started to see the potential in Data and Analytics. I was then on an international assignment in Ottawa, Canada supporting the integration of Nortel that Ericsson had purchased major parts of. Nortel had an excellent way of using data-driven decision making in their R&D organization and the management craving for data and facts was amazing. I really wanted to make this happen for Ericsson on a global scale upon my return to Sweden. However, that proved to be easier said than done. Not many people understood what I was talking about in 2010 when I was saying that not only do we need to digitize Ericsson ASAP (110.000 employees spread over 283 countries) to enable a fully data-driven organization. I had to work hard to gain the right management support for my ideas. My point was that we should not only provide the connectivity of billions of devices (IoT) supported by the much faster and more reliable 5G technology for connectivity, but we should also drive data and ML/AI opportunities related to this. After getting the chance to drive a couple of successful programs to establish first versions of this in the Radio Network domain, I transferred to the CTO office to drive the global Analytics and Machine Intelligence strategy for Ericsson, which I did during two years. During this time we widened the scope of our product offerings to not only regard network level products, but also to implement ML in the edge. In the network nodes themselves. Ericsson was first in the world with this capability. And finally last year I was asked to help drive a program to transform our Managed Services offering (managing Telecom Operators networks) to data-driven and preventive operations, fundamentally changing how we sell and operate our services business on a global scale. This new offering is called Ericsson Operations Engine and was launched on January 29th this year and will be shown to the world at Mobile World Congress in Barcelona Feb 22nd-28th. Namita: In our community, there are many women from college freshers, working women, women who have taken a sabbatical who are extremely interested in getting into the field of data science, AI and machine learning. What is your advice for them on how they can get started and make better progress forging careers in this field? Ulrika: Don´t bother so much about if you have a perfect education. If you understand and believe in data science, you can get far. This area is still evolving very fast, and everyone needs to continuously educate themselves on a continuous basis also after leaving the university in order to stay in tune with trends and the rapid technology evolution. Or even to get ahead of the competition with new solutions and offerings. Be bold. Go for it! However, although a lot has happened since 2010, there is still a lot of companies that do not understand the power of data science, or what it means to be data-driven or what the difference is between SW development and Machine Learning. Some companies believe they understand, but still think that as long as the data science team updates a dashboard every week, the work is done. As a data science professional you must be prepared to argue for your ideas, explain what data science actually means and give concrete and contextually relevant examples over and over again. To get people on board, and reach a point where you are able to do the really interesting things, you must spend some time to explain why and what the potential is. Don’t assume people understand. Even if they say so. As a data science team leader, you must be prepared to speak for your team, and protect them from people who do not understand what it means to create ML models and wants them to help crunch a data set for them etc. As a CDO or Chief Data Officer, you must also be prepared to stand up for a proper budget, sufficient headcount and time to show results. More and more companies are investing in a CDO to start leveraging their data as an asset, but many times the CDO´s are not given the right support to succeed. And many times the CDO is still not part of a company´s leadership team but reports to another C-level role like CIO, CTO or CMO. Sometimes also the COO. This needs to change, and most probably will over time. Again it will depend on how well data science is understood and invested in. Namita: You are passionate about the concept of Unified Analytics and have authored the book Unified Analytics for Dummies which is an amazing read for everyone interested in the concept. Can you tell us how you became passionate about this concept and what is the philosophy behind it? The area of data science is very much driven from an open source perspective and utilizing open source is also one of the cornerstones of Unified Analytics (UA). UA is a workspace solution that runs on top of the SPARK open source solution to accelerate and improve the usage of SPARK. The whole idea is that it does not have to be so difficult and expensive to invest in a capable AI/ML infrastructure. This is really an approach I support. SPARK was developed by an open source community called AMPlab, driven from the University of Berkeley but it included many different companies, even Ericsson was involved. It is also former students from that very community that now runs the company Databricks that offers the Unified Analytics Platform. However, Unified Analytics is more than a solution, it is also a concept of unifying data engineering and data science to enhance AI/ML productivity. Traditionally a gap often occurs between these two disciplines, where one unit prepares the data and another uses it for exploration, analysis and model development. However, it is unwise to separate these two disciplines, since they need to work closely together in an agile DevOps manner. This is really something I am passionate about since I have seen up close the consequences of when organizations not only consciously split-up these responsibilities believing that it is the other way around, but also the tendency to make things too complicated and expensive from an infrastructure perspective. This is usually done either by getting looked in on a vendor which limits what can be achieved, or they can never decide which vendor to go for, so small investments are spread across the organization on different vendor solutions, resulting in a situation where the value of data can never be leveraged. Namita: What are some of the biggest lessons you learned from being a technology leader and leading teams that you think might be helpful for other women who aspire to be in leadership positions as well? Be professional at all times, but don´t confuse that with being too tough or dismissive. Always treat people with respect and honesty and be generous and inspire as well as support people to reach further, that will generate loyalty and commitment amongst the people around you. Stand up for what you can and want to do. Don´t count on that anyone else will. Even if you have a good manager. Avoid company politics as much as possible. It is difficult at times to walk your own path, but I find that if you want to stand out and make a career on your own terms, feeling good about it, that´s what you have to do. After a while, you get a reputation of being open by willingly sharing knowledge and experiences, as well as being trustworthy and honest. And remember to always deliver on a promise! If you do that you will be assigned more responsibility, be given more interesting assignments and gain the respect of colleagues and customers. And if this approach does not work at your company, you are probably working in the wrong place! Namita: For those children who have an aptitude for technology, what are your thoughts on incorporating data science, ML and AI in our current education system? Ulrika: Incorporating data science in our educational system is an excellent idea! And it should start early. AI/ML techniques are really the future of our society. It is about so much more than making sure that your company becomes more efficient and earns more money. It´s about using these technologies to improve society for everyone regarding for example healthcare, elderly care, the educational system itself, developing and enhancing various environmentally friendly solutions, increasing efficiency in transportation systems, running smart cities and so on. Also, our children are subject to this technology from a very early age, so introducing it in school should be a non-issue. Their approach to AI/ML is more natural, and their power of innovation for the future could be unlimited. Namita: What inspires you every day? Ulrika: I am a very positive person with a lot of energy, and I don´t even drink coffee… I drink green tea to calm down. I am inspired by having a lot of freedom in my work. To have the possibility to get an idea and be able to work on that idea with a lot of competent people to bring that to a solution. Making a difference is important. I am very purpose driven and I love teamwork! It really inspires me to inspire other people. I believe I am a leader which leads by inspiration, but also openness and honesty. Actually, I think that being an appreciated leader is what inspires me on an everyday basis. Also Read - Should You Consider A Career As A Data Scientist? Loved reading this. Gained great knowledge. Thanks Namita and Ulrika! I am a content person, Ulrika, but j just loved reading your interview. I have just started acquainting myself to the AI and ML and might have just touched the tip, not even that I guess. But, my question to you would be, how is AI or ML going to incorporate human emotions specially something like empathy and understanding. I don't know if I have put it across properly, but this is what I wanted to ask. What an amazing read! Loved all of it, especially the part about making a difference! Hats off to you amazing lady.